"I was licensee of the Golden Hind, Hastings from 1977 to 1979", he said. "The history of the Golden Hind, as I remember it, was that it used to be the Provincial Hotel for many years and finally closed its doors in the late 60s. The building became derelict and was bought for next to nothing by Jimmy Demetris, who owned many Old Town properties, several of them restaurants, including the Mayfair at the end of Pelham Crescent where the family lived. He used to give some pretty seedy characters a place to live in return for them working for him renovating properties. The Provincial was one of these. They only ever finished the ground floor and part of the first floor. He then gave the pub to his sons to run. The older son Steve was responsible for the opening of the Golden Hind and for inventing the persona of the pub. The younger son Akis was the 'accountant'. 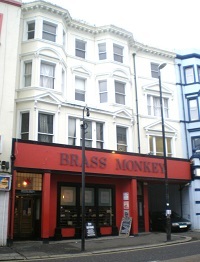 It would have opened around 1976 or 1977 and was a disco bar in the back and a lounge bar in the front. Steve Demetris had, and still does have, another career as a musician and he quickly tired of being the face of the Golden Hind and basically deserted it, leaving it to various bar staff to run. Disaster ensued. I had always fancied being a publican and had been working part time in the pub. I told him of my ambition and he literally handed me over the keys. I was 19 years-old at the time. We had a bit of a task assuring the magistrates that a 19 year-old could run a very busy and successful pub in the town centre, but I mollified them by holding a joint licence with Steve for the first year. I think I am the youngest licensee in Hastings to this day. It really was tremendously successful and as the real ale renaissance was just starting, and I had a huge interest in this, I quickly turned the front bar into a haven for beer enthusiasts which proved very successful. As did the pub games I introduced into the back bar for the early part of the week. We ended up with winning darts, shovepenny and soccer teams as well as the disco, packing both bars at the weekends with excellent local DJs like Tony Davies and Johnny Francis. Great times. Eventually Steve received an offer he couldn’t refuse from a consortium of chaps who used to work at a factory on Ponswood Estate. They already ran the Crown House social club and wanted to expand. Steve by this time, was never seen. I only used to see Akis once every so often when he came to collect the cash. The front man/woman were Howard and Diane Haskell and in the background were Phil Bebb and John Wilkinson. Steve ensured that they kept me on. I worked for them for a couple of years before leaving to join Martlet Brewery as their free trade rep. They ran the pub successfully for another couple of years before leasing the building to John and Barbara Gadd, I am unsure of the surname, who used to run the East Hastings Angling Club. I am guessing they took the pub in around 1983. Since then the pub has been totally ripped out inside. The Golden Hind was very much using the old Provincial interior, including some wonderful wooden panelling in the back bar, unfortunately long since gone. The local Citizens Band Radio (the Bluebeard Breakers) used to meet in the Golden Hind and did indeed operate from the p ub, A 'breaker' is American CB slang for somebody breaking the silence, as simple as that. In typical CB fashion they nicknamed the Golden Hind: 'The Bluebeard' as Steve Demetris had a very dark beard. 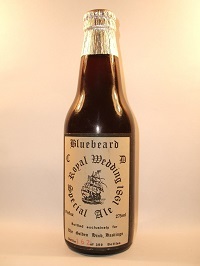 The name stuck and after he sold the pub to Howard Haskell et al I arranged for the production of our own Royal Wedding ale known as ‘Bluebeard’ in 1981. I signed some labels, as did Howard, and there was also a run of unsigned but numbered bottles. Some of these are not genuine though; there was a lot of copying/forging going on to get swaps. The bottles here are signed by Howard; I would love to find one of mine! The beer was brewed for us by Martlet of Eastbourne who I later joined as a rep. We also had our own draught version on sale at all times, one of the first if not the first house beer! As far as I am aware 'Bluebeard Bitter' was the first beer brewed especially for a pub in the Real Ale renaissance, it was actually a mix of Martlet Regency Bitter and Brighton Special Bitter, which was extra dry hopped and had a character all of its own. It was not a standard beer sold under another name."